Good news to all Mi fans! 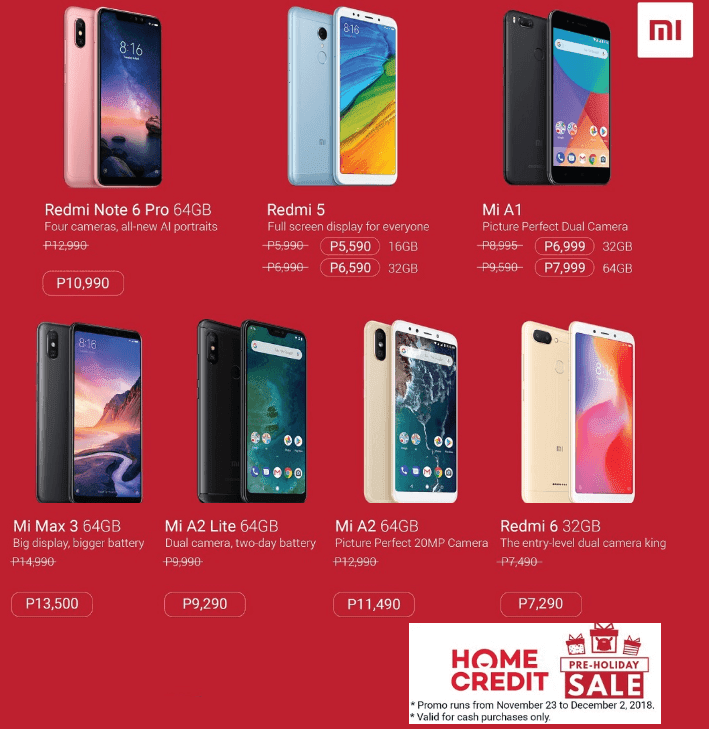 Xiaomi Philippines has announced its pre-holiday sale promo, where select smartphones can be purchased at a discounted price. The Mi Store Sale promo runs from November 23 to Dec 02, 2018, and is valid for cash purchases only. Buyers can also avail installment options via Home Credit. Participating products include the Redmi Note 6 Pro, Redmi 5, Mi A1, Mi Max 3, Mi A2 Lite, Mi A2, and Redmi 6. This allows consumers to get their new Xiaomi device with up to Php2,000 discount. One of the best smartphones you can purchase is the Redmi Note 6 Pro. The device sports a 6.26-inch IPS LCD panel with 19:9 aspect ratio. Inside, the device carries a Snapdragon 626 chipset paired with 4GB RAM, and 64GB of internal storage.The handset is powered by a 4000mAh battery and runs on MIUI 9 (Android Oreo). The device sports dual rear cameras, and dual selfie snappers with AI capabilities. Xiaomi has partnered with Home Credit to offer this promo on their various installment plans. You can now buy Xiaomi products through Home Credit. The service is now available at the flagship Mi Store in SM Megamall. You can now buy your favorite Xiaomi products through Home Credit. And just in time for the holidays too. At the moment though, it is available only at the flagship store in SM Megamall. Home Credit will allow you to buy Xiaomi smartphones, appliances, and accessories in installments even with no credit card. If you’re looking for a good smartphone this Holiday season, this is your chance to get a great deal! Hurry up, the promo runs until December 2, 2018 only.